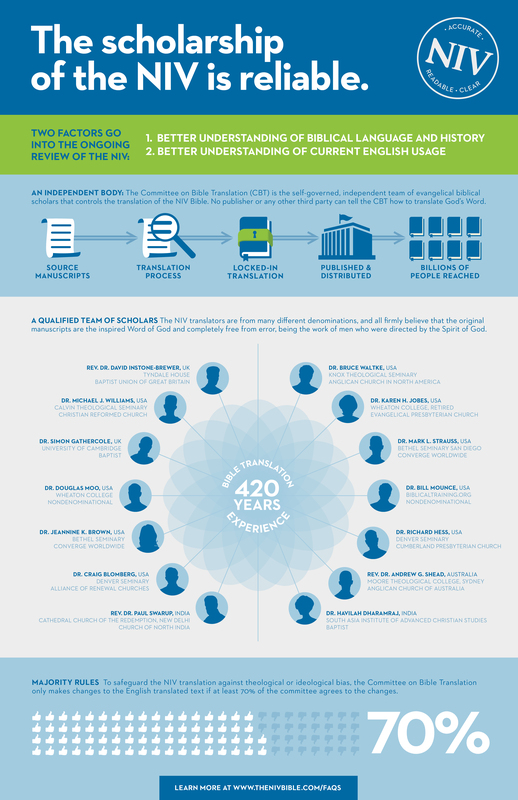 Who is on the Committee on Bible Translation (CBT)? The committee represents the very best in evangelical biblical scholarship, and our members are drawn from various denominations and from some of the finest academic institutions in the world. See the complete list of the CBT members. What are the CBT’s translation guiding principles? The chief goal of every update to the NIV is to ensure that the text reflects the latest and best biblical scholarship and established shifts in English idiom and usage. The 2011 NIV update represents our latest effort as a committee to articulate God’s unchanging Word in the way the original authors might have said it if they had been speaking in English to the global English-speaking audience today. This is the reading experience that the NIV seeks to recreate. Our aim is to translate the NIV in such a way as to provide the optimum combination of transparency to the original documents and ease of understanding in every verse. 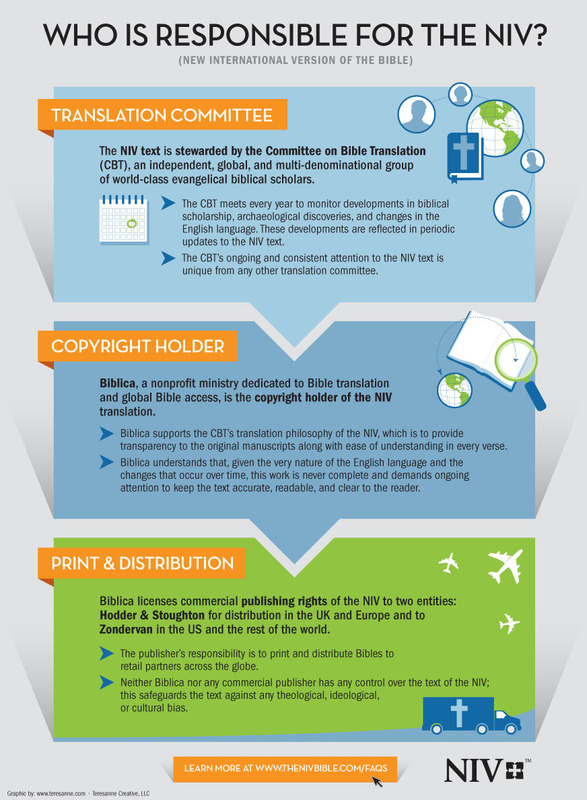 Learn more about the NIV translation philosophy. How does the CBT work? Describe the translation process. Watch a Q & A Event with Bible Translation Committee Members held at the Evangelical Theological Society in November 2014. 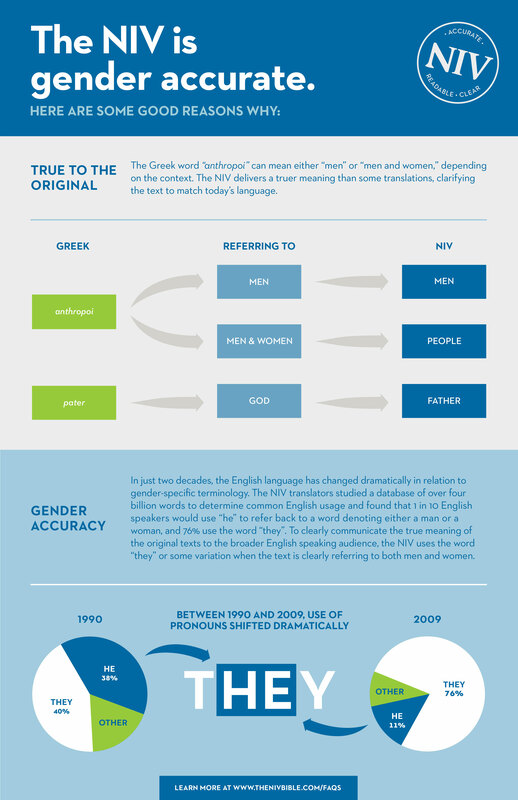 The translators have used the accepted Greek New Testament text, as printed in the Nestle-Aland and United Bible Societies’ Greek New Testaments. Here also the translators have occasionally accepted a variant printed in these editions. Footnotes usually indicate the options in each case. When did the translation process begin? The CBT was formed in 1965 to create a modern English Bible translation from the oldest and best-attested biblical manuscripts. From its inception in the 1960’s to the emergence of the first complete NIV text in 1978, the NIV translation team has continued to meet, year after year, reviewing developments in biblical scholarship and changes in English usage – revising the translation to ensure that it continues to offer readers an experience that mirrors that of the original audience. The 2011 update is the latest fruit of this process. 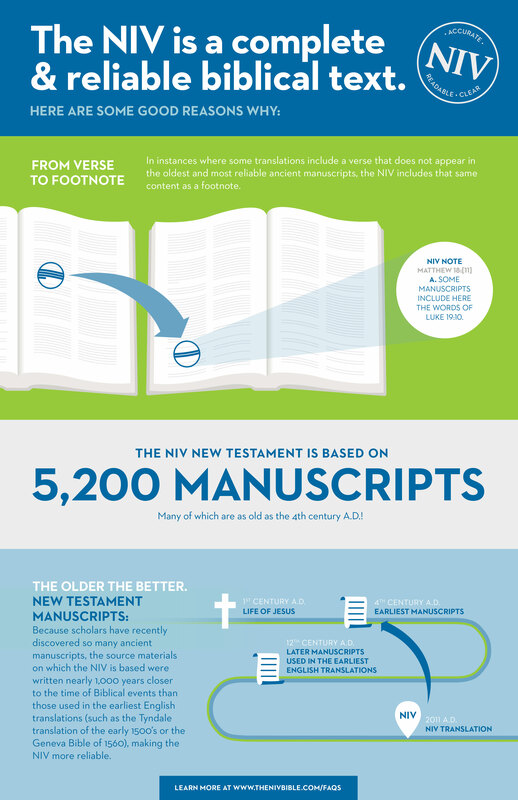 Learn about the history of the NIV. The original NIV charter requires us to constantly monitor developments in biblical scholarship and changes in English usage and to reflect these changes in periodic updates to the text. Without these periodic updates the NIV would be unable to maintain the priorities that have drawn people to it over the years: providing the optimum blend of transparency to the original text and ease of understanding for a broad audience. In the latest update in 2011, about 95% of the text remains exactly the same as the 1984 NIV that it replaces, based on the number of word changes. What are the differences between the NIV 1984 and the updated NIV in 2011? Who is responsible for maintaining the NIV text? Did the CBT compromise on “controversial” verses to appease critics? As a committee, our priority is to accurately translate God’s unchanging Word into contemporary English, incorporating the best available biblical scholarship. In any instance where we became convinced that past decisions failed to live up to this standard, we did not hesitate to change them. If there was compelling new data on the state of contemporary English usage, or if a compelling exegetical argument was made – whether it involved moving backward or forward – the committee made the changes that were necessary. We are not wedded to any particular verse as it currently stands or as it has stood in any previous edition of the text. We are simply committed to our responsibilities under the charter: to render God’s Word in English as it is spoken and understood by the broadest possible audience. How are gender-related issues handled in the NIV? Our mandate under the NIV charter is to maintain the NIV as an articulation of God’s unchanging Word in contemporary English. To the extent that gender-inclusive language is an established part of contemporary English and that its use enhances comprehension for readers, it clearly was an important factor in the decisions we made. Here’s the good news: no verses are missing. The King James Version translators used the best manuscripts available in 1611. Fortunately, many older manuscripts have been discovered and carefully evaluated by scholars, with the conclusion that the older manuscripts are more reliable. This has given modern translators unprecedented access to manuscripts closer in time to the original documents. The “missing verses” some have mentioned are not found in the oldest and most reliable manuscripts so modern translators included or referenced them in footnotes. The translators of the King James Version used the best resources available to them at that time and for their day, the King James translation was a monumental achievement. No doctrines of the Christian faith are affected by differences between the King James Version and the manuscripts that it translated and modern translations following more reliable sources. The New International Version is the most widely read Bible translation in contemporary English. From the beginning, the translators have been committed to getting the words right. That means being true to the original Greek, Hebrew, and Aramaic of the Bible while at the same time capturing the Bible’s original meaning in natural, everyday English. All the NIV translators believe that the Bible is God’s inspired Word. That conviction, along with their years of studying biblical languages, has helped them capture the depth of meaning in the Bible in a way that is accurate, clear, beautiful, and trustworthy. Why does the King James Version have additional verses not included in modern translations? In other words, sincere, believing Bible scholars today almost universally agree that modern translations like the ESV, NASB, NLT, and NIV did not remove verses that should be in the Bible, but rather that the KJV translators innocently and unintentionally added verses that earlier and better manuscripts which they did not have available show should not be in the Bible. It is important to remember, though, that one thing tends to get lost in this debate—the number of such verses is almost infinitesimally small, and no matters of Christian doctrine are affected. How is the Greek word “Malakoi” translated in the NIV? Are word-for-word Bible translations more accurate to the original meaning? (Dr. Bill Mounce) One of the things that I really learned since being on the CBT, it’s not because I’m on the CBT, it’s just watching this happen thousands upon thousands of times. You realize that accuracy and meaning are tied together. I think before, I kind of thought more that accuracy was, well, if I can stick to Greek structure, Hebrew structure, then I’m being more accurate. But, literalness has to do with meaning. It doesn’t have to do with form. That’s what the English word means, and so when you translate, but you don’t get the meaning across, you haven’t been accurate. The main difference for me is the change from sticking to translating this word, this word, this word, and if you can kind of make sense out of it, that’s okay; to in this group, it’s really, how do these words hit you. Does it hit you the same way it would have hit the initial audience? And so, in the CTB, we spend a lot more time than I am used to at making really proper English and good-sounding English. And so, that’s a different emphasis for me. That’s what took the time. (Dr. Bruce Waltke) For example, if I say, “hand,” I think you think of the palm, but the Hebrew doesn’t mean that. When the Hebrew says, “hand,” it means from the elbow to the fingertip. Now how do you translate that? You see, there’s no word for that in English. That’s why no translation is perfect because it’s no one-for-one correspondence, and yet you’ll hang bracelets on your hand. How do you hang bracelets on your hand? The Hebrew makes a distinction between, he calls this is (Hebrew word) and this is (Hebrew word). The Hebrew makes that distinction, but English doesn’t. (Dr. Karen Jobes) When I was a little girl, and I think a lot of us do this, and I was interested in other languages, and so we got a hold of a French dictionary. What I did is I just went through in an English sentence, and I would replace every English word with the corresponding French word, and of course, what results is not French because you can’t just plug word for word in and come out with a translation. So I think the idea that for word-for-word translation is more accurate is basically wrong. That’s not how languages work. No translation is always strictly word for word, and no translation is always strictly paraphrased. Every translation has elements along this spectrum, but we try to be very deliberate about a mediating position where we maintain the accuracy of the word originally, but without thinking that we need to maintain the syntax of the original languages because then you get back to something that is very much like I did as a child where you’re kind of plugging English words into Hebrew or Greek syntax, and what you come out with is not really English. (Dr. Mark Strauss) You can trust the NIV because it has very strong scholarship behind it, but it also has, there’s a sense of respect and reverence for the Bible as God’s Word. All the translators believe fully in the inspiration and authority of Scripture. And so, it is God’s Word, but it comes to use through human instruments, and therefore, we need to understand it, and we need to understand what it means so that we can then unpack that and translate it in a clear manner. So those two things, that it is accurate to what the message is, but it’s accessible. It’s understandable and clear. (Dr. Paul Swarup) The passion among the room is that, you know, we need a translation which is both faithful to the original text and, at the same time, can be easily understood by the current generation. That’s really the passion, and that’s the tension that plays out in our discussions. You know, whether how much do we stick to the original text, and at the same time, we don’t want to lose this, you know, but at the same time, to make it relevant to the current generation. And so to hold these two together, that’s really, you know, it’s a fine dance. You know, one has to do that, I mean, so there’re arguments and tugs and pulls always towards maintaining that balance of how we can be faithful to the text and faithful to this generation to which we want this text to be easily accessible. Members of the Committee on Bible Translation explain how accuracy is directly tied to meaning in translation work and offer insights and examples from the NIV. Are word-for-word (or “literal”) Bible translations the best at accurately conveying the meaning of the original inspired text of Scripture? No. In fact, there aren’t any popular English Bible translations that are actually literal. For example, here is Young’s Literal Translation (YLT) of 2 Peter 1:20-21 compared with the New International Version (NIV) of the Bible. What is the relationship between Zondervan and HarperCollins Publishers? HarperCollins Publishers is our parent company and fully supports our commitment to our mission and our Christian core values. Zondervan, a well-known and respected Christian publishing company, is part of HarperCollins Christian Publishing and has been a HarperCollins company since the early 80s. HarperCollins has many different publishing groups who produce a wide range of content, none of which affects our Christian mission and purpose.